Flakpanzer IV (3.7cm FlaK) Ostwind (Eastwind). With the destruction of the Luftwaffe and the withdrawal of surviving units to Germany for home defense against the air war, the Wehrmacht was at the mercy of Allied air superiority. 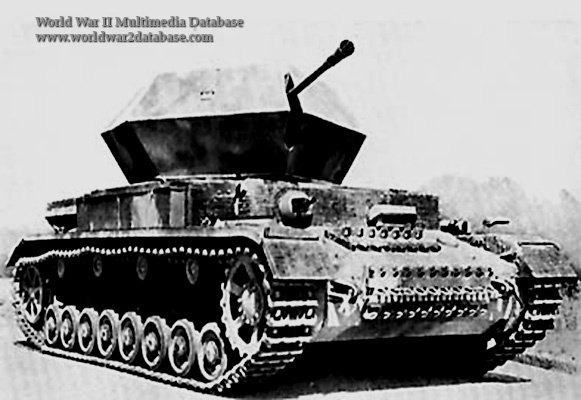 To protect mobile armored columns, they developed purpose-built anti-aircraft tanks. Retired or battle-damaged Panzerkampfwagen IV chassis at Ostbau Works in Sagan, Silesia. When that factory was going to be overrun, production moved to facilities of Deutsche Eisenwerke in Teplitz and Duisburg. Only 44 Ostwinds were made, but they were very effective against ground attack aircraft. All of them were issued to Panzer Divisions, making their combat debut during the Ardennes Offensive in December 1944 by 1st Waffen SS Panzer Division "Leibstandarte SS Adolf Hitler." The vehicle mounted a 37mm Flak 43 cannon, which could be depressed to fire against ground troops.